The National Agency of Petroleum, Natural Gas, and Biofuels (Agência Nacional do Petróleo, Gás Natural e Biocombustíveis – ANP), Brazil’s oil industry regulatory authority, held the fourth round of auctions and sold three pre-salt oil fields in the Santos Basin, off the coast of São Paulo, and in the Campos Basin, offshore Rio de Janeiro, on last Thursday (7). Experts told Brasil de Fato the auction is a big step to dismantle the country’s oil industry. The Uirapuru (Santos), Três Marias (Santos), and Dois Irmãos (Campos) fields were bought, respectively, by the ExxonMobil, Petrogal, and Statoil; Chevron and Shell; and Statoil and BP Energy consortia at R$3.15 billion (around US$820 million). Petrobras, the country’s state-owned oil company, will keep only a minimum 30% share of the Uirapuru and Três Marias blocks, and a 45% share of the Dois Irmãos block. The president of the Assocation of Petrobras Engineers (Associação dos Engenheiros da Petrobras – AEPET), Felipe Coutinho, said the signing bonus in this round was too low compared to the potential revenue of the fields’ entire oil production life cycle. “The auctions that are being held since this administration took over are compromising the country’s future. The government’s excuse is that they have to pay short-term commitments, especially with the public debt, the financial system, and the banks, but they are giving away a strategic wealth to multinational corporations,” he said. Private oil companies competed with Petrobras in an oil field auction for the first time in October 2017, after the Michel Temer administration changed the rules for production-sharing agreements. Before the new rule, the country’s state-owned giant had the controlling interest in all pre-salt blocks, and had to own a minimum 30% participating interest in consortia established to exploit the resources. Since the new rule was approved by the country’s National Congress – at the request of Petrobras’ former CEO Pedro Parente, who resigned last week after pressure by people’s movements and two major strikes –, the company no longer has to have a minimum participating interest in operations. Rodrigo Leão, an economist at the Institute of Strategic Studies on Petroleum, Gas, and Biofuels (Instituto de Estudos Estratégicos de Petróleo, Gás e Biocombustíveis – INEEP), argues that the auctions are being held too hastily, which makes it easier for foreign corporations to take over operations in the country. “When Petrobras had necessarily to invest in everything, the government somehow depended on the company to be able to hold auctions. But now, because it no longer has to take part in auctions, this makes it easier for other companies to win the bid if Petrobras does not have the resources [to take part in the auction],” he pointed out. The fields auctioned last Thursday represent around 14 billion barrels of oil and gas reserve, which is nearly 10% of the proven reserves of Brazil’s pre-salt layer, of approximately 150 billion barrels. With the auction, Leão says, in addition to losing revenue generation capacity with pre-salt resources, the country will also be impacted in terms of job creation. 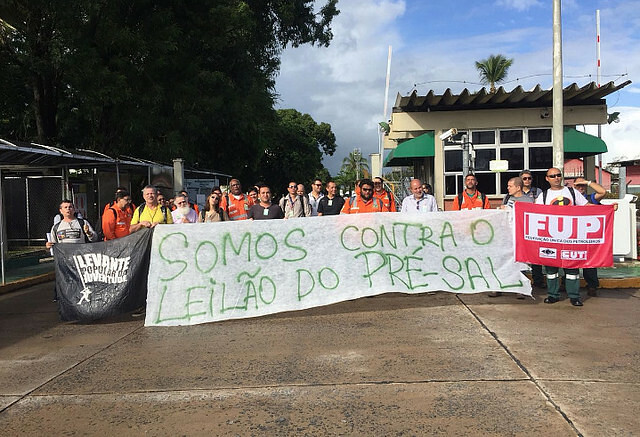 “We’re transferring job and income from Brazil to other countries, because these companies will use labor and equipment from their home countries, resulting in fewer jobs in the engineering and shipbuilding industries. The auction processes are increasingly fast, sucking real resources away from inside out. This is a very difficult process to overturn,” he said.